Slime satisfies 4 out of our 5 basic senses. Senses are how we enjoy life. Not only does my kid like making and playing with slime, she likes talking about. She chats with her friends and watches videos describing satisfying slime. Kids like to talk about how they feel (what they see, smell or taste). When talking about flavors with kids, I bring bottles and aroma blotters. I do not tell them what they are smelling, but let them guess and talk about what they smell. They chat about experiences, they get excited, they want to share. They engage. Once the kids start talking, I ask them to make different flavors. I do this by sharing some basic recipes for flavors: root beer, fruit punch, bubble gum, mango, pinacolada and cotton candy. Then, I encourage them to combine the different aroma strips and have fun experimenting. 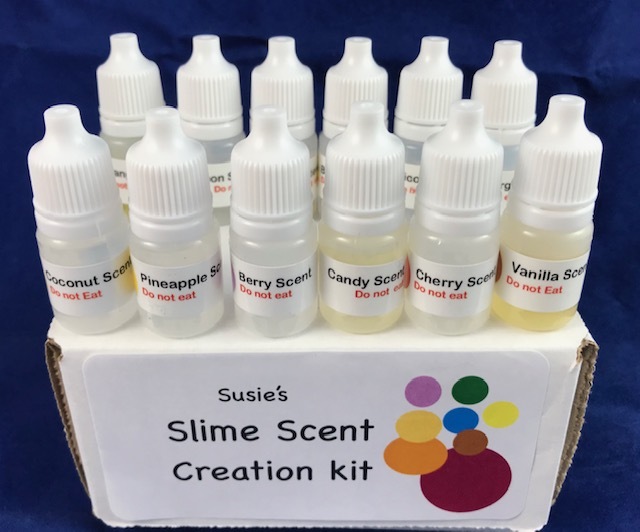 For kids that like to experiment, I can provide a slime scent kit for a fee. 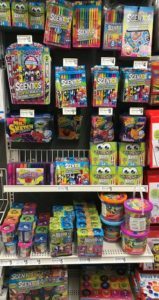 These kits contain 12 scents which can be use alone or in combination to make fun flavors for slime. The possibilities are endless. Starting recipes are in the package. If you are interested in a kit, send a note to susie@flavorscientist.com. I can only ship to continental United States. These kits are recommended for children 9 years old and over with adult supervision. Scents are not to be ingested or inhaled, gloves are recommended. The sensory impact of slime is fascinating, but so is the science. Jenny Ballif, science mom, does an excellent job explaining the science of slime in this video.